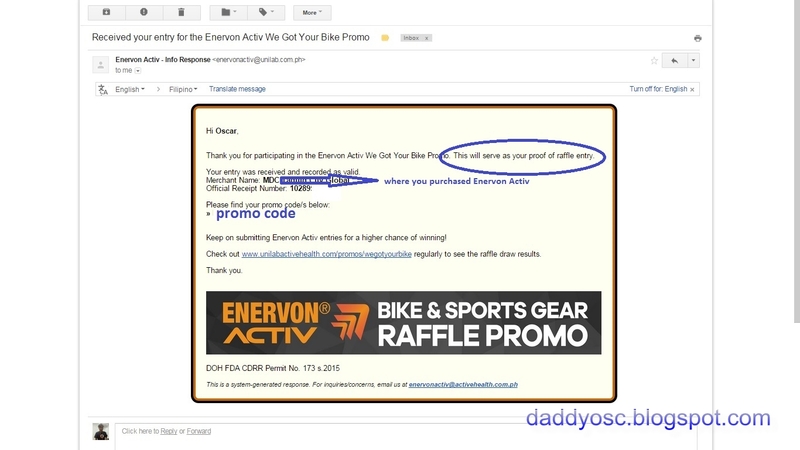 ENERVON ACTIV We Got Your Bike and Sports Gear Promo | Daddy O! 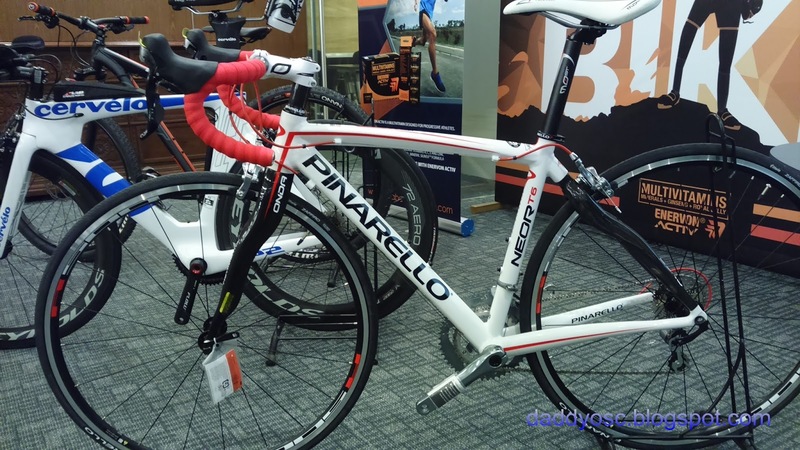 Do you want a brand new Bike? 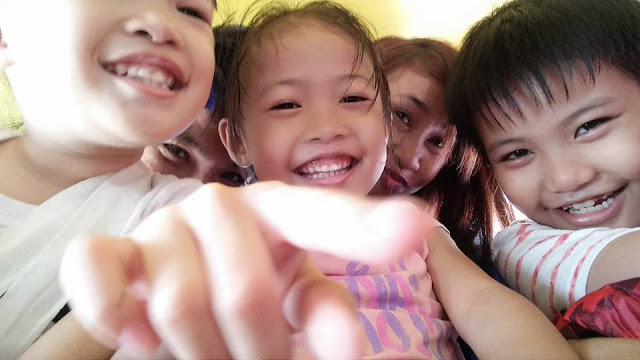 Like this??? A brand new PINARELLO NEOR, FELT NINE4, or FELT Z5 will be given away to the lucky winner of Enervon Active We Got Your Bike Promo! 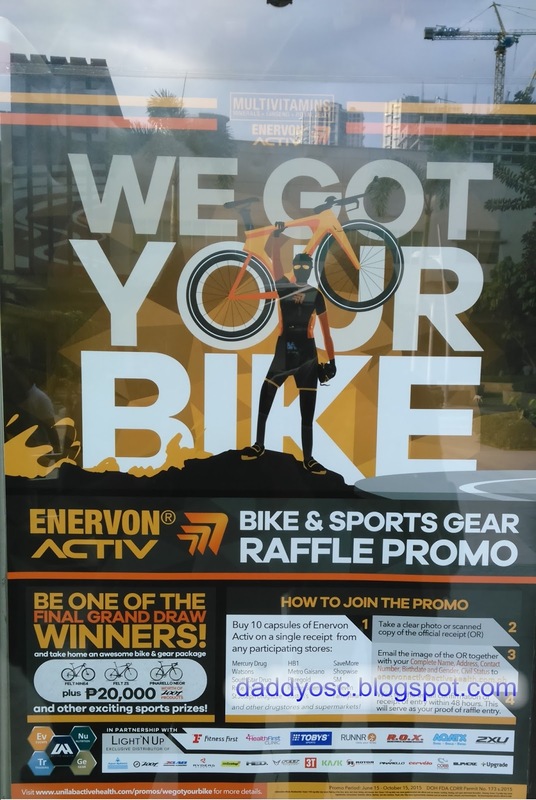 As easy as 1 - 2 - 3 - 4 steps, and get a chance to bring home with you and other prizes as Enervon Activ We Got Your Bike promo is on-going until October 15, 2015. 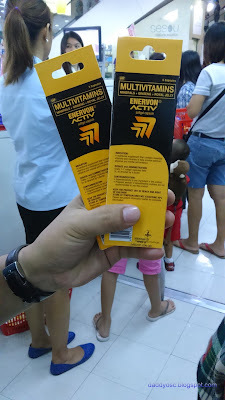 Buy 10 pieces of Enervon Activ on a single receipt from any participating stores: Mercury Drug, Watsons, South Star Drug, Rose Pharmacy, St Joseph Drugstore, HB1, Metro Gaisano, Puregold, Robinsons Supermarket, Rustan’s, SaveMore, Shopwise, SM, 7Eleven, FamilyMart, and all participating supermarkets and drugstores. Secure the Original Receipt for Step 2. 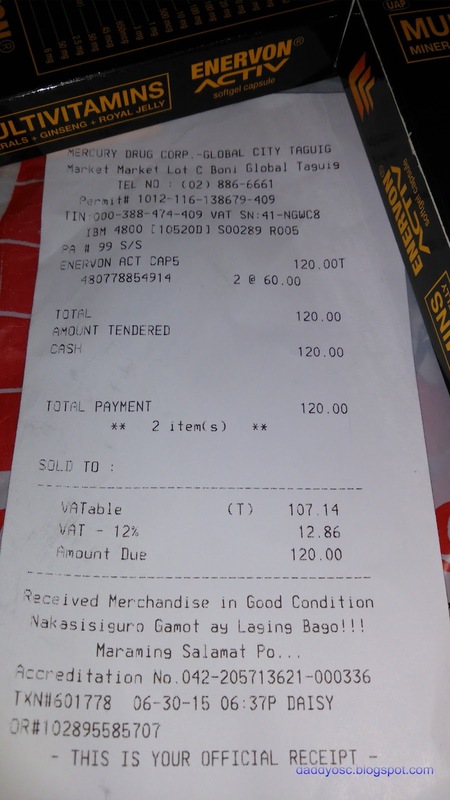 Take a clear photo of the Official Receipt (OR) using your phone camera or scan the receipt. Wait for the email confirmation of the receipt of entry within 48 hours. This will serve as your proof of raffle entry. Note: You will receive an email confirming that you have submitted an entry. The system will validate if all information details are filled-up. 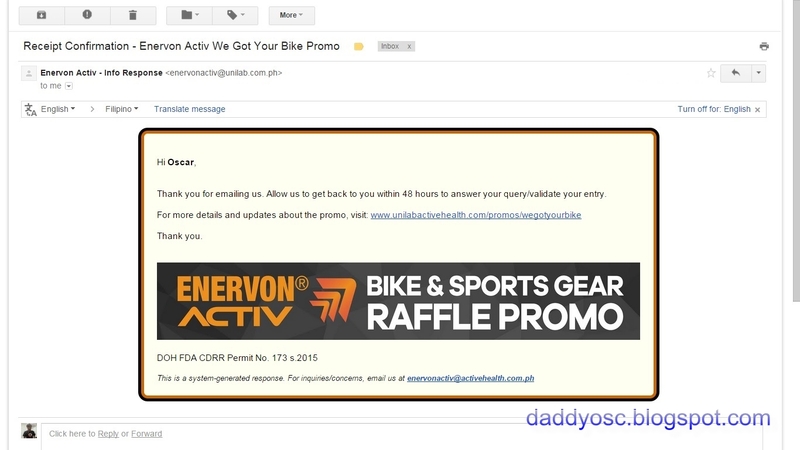 Once validated and with complete details, you will receive an email confirming from enervonactiv@activehealth.com.ph saying, "This will serve as your proof of raffle entry" with valid unique promo code. 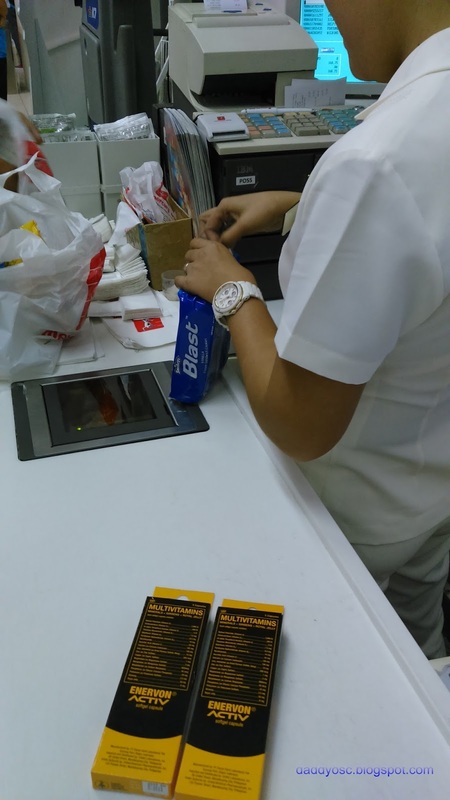 Aside from joining the promo, you too could also enjoy the benefits of taking 1 Enervon Activ capsule a day. It will give you strength, improve your stamina, and boost energy. Like me, prior joining the 3K and 10K, I drink 1 capsule a day during pre-event training. 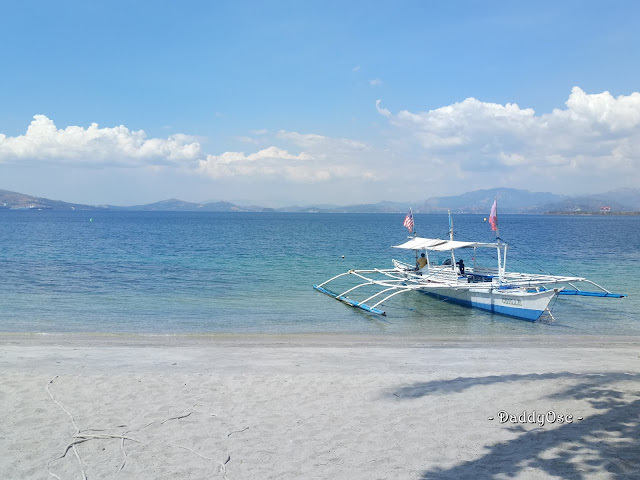 At first, it's not easy to join the running event since no workout at all because of the eagerness to go home and to take some rest. 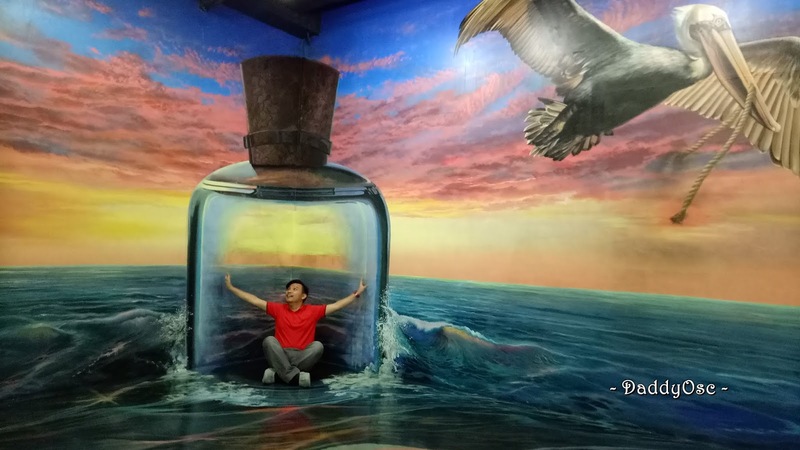 But, when the time I started to drink Enervon Active 1 capsule a day, it keeps me awake the whole day and after work (with extra time) walking and running session nearby the office. The capsule has B-Complex, Ginseng, and Royal Jelly for Powerful Energy Boosters. So, the routine was changed. I got another time for session which prepare my body prior running. It has also Vitamins A, C, E, and Zinc as immunity strengtheners. The most important component in Enervon Activ capsule is the Mineral SIUM 5XTM formula which will improve your muscle control when you running especially the leg muscle. Not only for athletes but also for those who are doing workouts. The composition of SIUM 5X are; Calcium, Iron, Magnesium, Phosphorus, and Potassium. So, what are you waiting for? Join now and be the lucky winner to take home a new bike and other sports gear. 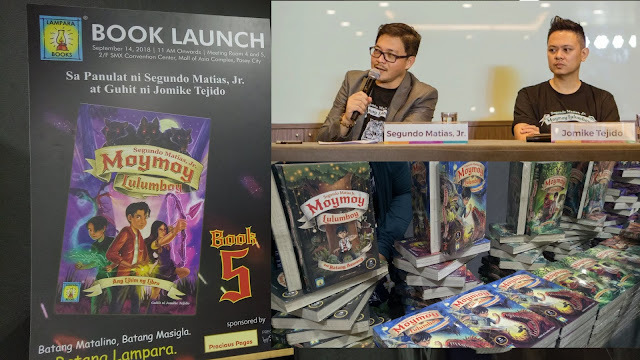 up to October 15, 2015. 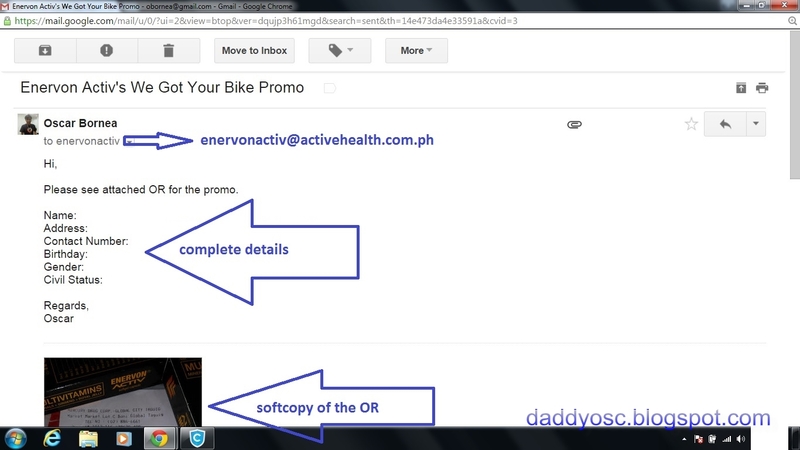 To know more about #wegotyourbike promo, visit http://www.unilabactivehealth.com/promos/wegotyourbike/ for more details. Congratulations to Mr. Arman Paez for winning the first monthly draw of #wegotyourbike promo. 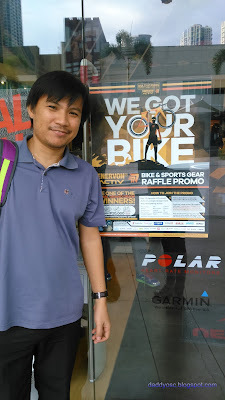 He'll take home Ph30,000 worth of Bike and/or gear from Light'n up and Ph20,000 worth of Zoot products. Stay tune for the 2nd monthly draw on August 16, 2015.